Every year the motorcycle manufacturers of the world roll out their shiny new bikes, and tell us about how cool their new stickers look, how their new suspension offers a ride like no one has ever experienced before, and how their engine is at the forefront of modern technology. Yeah, yeah, got it. We’ve heard it all before. Now, the manufacturers might have the full intentions of making new bikes better than their old ones. But seriously how much better could the 2017 450 be when compared to 2016 model? OK, so maybe we’re being a bit dramatic here, and probably a bit numb at times to the latest new bikes, as we get to ride bikes every other week. 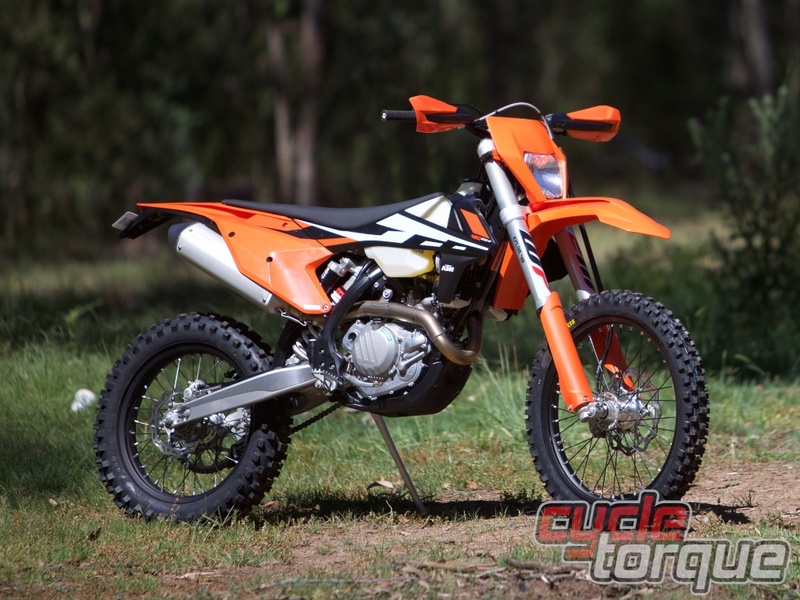 But leading up to the day of our KTM 450 EXC-F test it felt like we were heading off for a ride on yet another new bike. Well… weren’t we proved wrong! KTM got the message loud and clear, the open cartridge forks are well beyond their ‘best before’ date, and the WP 4CS forks which graced the Six-Days model for the past few years, are simply not up to scratch. Enter the all new 48mm Xplor forks. Simply put, the Xplor fork is a collaboration between WP and KTM which maintains the split fork concept from the 4CS forks, with compression in one side, rebound in the other, and springs in each fork leg. Inside, the design and material coatings are quite different which contributes to the massive improvements claimed by KTM. The PDS rear shock systems stays put underneath the orange machine. It’s a trustworthy unit, which has proved to work remarkably well in the bush. Internally, it has a new smaller diameter piston, increased reservoir capacity, 4mm shorter stroke, and a new second piston design which offers a more progressive action. The chassis may still be a chromoly steel design, but it’s now much lighter, claimed to be one kilogram lighter than the nearest competition. Thanks to developments that have flowed down from the motocross models, the frame is now stiffer in the lower sections of the chassis: offering increased rider comfort and more precise handling. The swingarm is slightly different for 2017, with a new PDS mounting position, the more symmetrical design brings the rear shock closer to the centreline of the bike by five millimetres which allows the load to be distributed more evenly across the machine. The engine has undergone some pretty serious changes with the entire crankshaft moving backwards 9mm and raised seven. This also means new engine cases and covers, which shave around 550 grams of engine weight. A shorter cam chain connects the crank to the all-new camshaft, which sits comfortably in a redesigned cylinder head. Keihin take care of all the electronics and fuel-injection with an updated 42mm throttle body, and dual engine mapping system. The engine maps are accessible via a simple switch located on the handlebars. The rest of the package is what we have come to know and love from KTM. Ready to Race. Brembo brakes, no-tool required air filter access with a Twin-Air filter, hydraulic clutch, lithium-ion battery, keyless electric start, 8.5-litre translucent fuel tank, black wheels, and all-new styling and bodywork.